It has been several years since I started to listen respectfully to the Dharma expounded by H.H. Dorje Chang Buddha III at Hua Zang Si. I have received great benefit from learning the principles and developing correct understanding and views. My heart is filled with Dharma joy and I express my ultimate gratitude to the Buddha. Whenever I listen respectfully to the Dharma expounded by H.H. Dorje Chang Buddha III, it always feels like a timely warning to me. After I reflect and examine my daily conducts, I always feel very ashamed. I deeply feel that my words and conducts have not been in accord with the teachings of the Buddha. The dreadful discovery often gives me cold feet. Life is short and full of suffering. Why have I continued my ignorant actions which will result in negative karma and degeneration? When will the suffering of reincarnation come to an end? Hereby, I repent and vow to follow the Buddha to practice Buddhism and cultivate myself. I beseech liberation and accomplishment. I hope to enlighten myself and others. I will cherish all the holy and magnificent Dharma I have listened to. My second reason to start a Dharma center is that I have felt joy from listening to the clear teachings of the Buddha. I feel that I have a direction in life now. If I do not fight for liberation in this lifetime, when else will it be? It is truly a great karmic condition to be born in the same life time of the Buddha and to be able to listen respectfully to the Dharma of the Buddha. This is difficult to encounter in millions of eons. We really should greatly appreciate the opportunity. My heart is full of Dharma joy. I have become optimistic in my outlook and see beauty in the world. I am filled with energy to propagate the Dharma. Also, things in life have gotten better. My third reason to start a Dharma center is that I want to follow exactly what the Buddha has told us to do. The Buddha has said that the Buddha Dharma is the law of cause and effect. The law of cause and effect does not err. It is an iron clad universal principle that does not perish. Therefore, I must follow the teachings of the Buddha—do no evil and do all good. After we understand the principles, we will put them into practice. By relying on the Ten Good Deeds, the Four Bodhisattva Virtues, the Four Limitless States of Mind, the Three Cumulative Precepts, Mahayana Bodhicitta and the Six Paramitas, I will practice according to the Dharma and abide by the precepts. May I realize the Bodhi together with all sentient beings in the three spheres and the six realms. 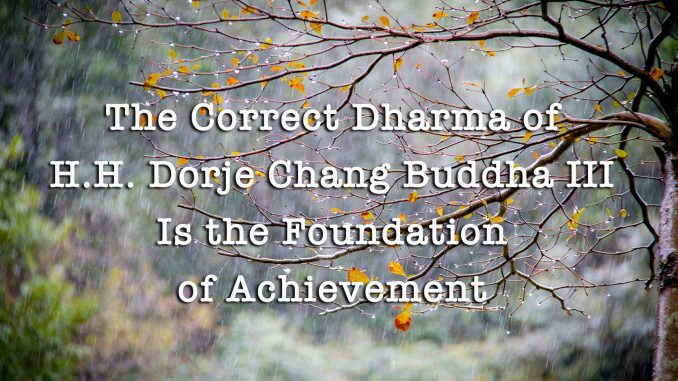 I firmly believe that the correct Dharma of Dorje Chang Buddha is the foundation of accomplishment. Yet, when I looked back, it is just not enough to listen to the Dharma for my personal benefit or joy. The Buddha’s propagating the Dharma and benefiting beings is to save all beings who have karmic affinity with Him. Since I have vowed to follow the Buddha to practice Buddhism and cultivate myself, I should then emulate the Buddha in benefiting all beings. I hope that all who have karmic affinity with me will receive the same benefit from the Buddha’s teachings, make the same vow to follow the Buddha, engage in the same correct conduct of Buddhism, receive the same Dharma joy and seek the same liberation. Because of the above reasons, I earnestly applied to establish a Dharma-listening center in March, 2009. I passed the exam and receive the title of Dharma-Listening Session Master in August, 2009. In over two years, I have worked together with friends who have karmic affinity with me and opened six Dharmalistening centers: one in California, U.S.A., three in Shenzhen, China, one in Guangzhou, China and one in Sanya, Hainan. Five of the people in charge of the Dharma-listening centers have one by one passed the exam and received the title of Dharma-Listening Sessions Masters. We have worked hard on building good karmic affinities with others and propagating the correct Dharma of Dorje Chang Buddha. We hope to guide more people to learn Buddhism, engage in self-cultivation and walk on the correct path of Bodhi, which will accumulate countless merits. Hereby, I again beseech the empowerment and support from the Buddhas, Bodhisattvas, and holy Dharma protectors to help me to lead more people who have karmic affinity with me to listen respectfully to the magnificent Dharma of Holiest Tathagatha H.H. Dorje Chang Buddha III. The Dharma will definitely help them to develop the correct understanding and views of Buddhism and self-cultivation, gain great benefits, obtain happiness, liberation, and accomplishment.